Two men in Indiana accused of posting a fake picture of two fish frozen in a death-grip have gone the extra mile to validate the image. 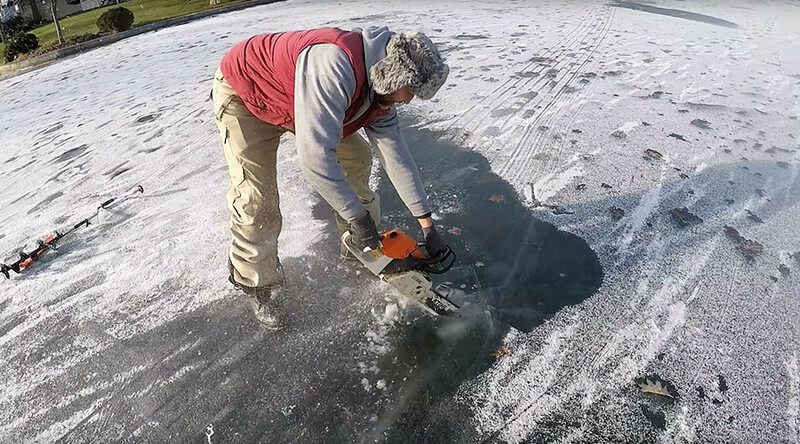 Using a chainsaw and a high-level of trust in the ice, Anton and Alex Babich cut a block of ice right out of a Lake Wawasee to better exhibit their extraordinary find. Displaying it for all to see, the block clearly contains an unlucky bass in the jaws of a very hungry pike. The video was made after a photograph of the entangled fish went viral earlier in the month. Some commenters did not believe the post was genuine, calling “BS” on the image. The accusations resulted in the brothers taking a chainsaw to the naysayers. “Looks like to me that the pike tried to eat the bass but the bass got blocked in the throat of the pike and blocked the gills in w[h]ich killing the pike,” posts one commenter on Facebook, putting to rest questions of how the fish became frozen in such an unusual position. After choking it’s believed the fish would have floated to the surface where it froze over time.